Knotty Pine Oceanside Cabin-Awesome Ocean View- Amazing Tree Deck! Lovely 1930's Knotty Pine ocean view cabin right in the heart of Oceanside. Kid and pet friendly. Located only a few minutes walk to the beach, this cabin comes with a fully supplied kitchen with stove, microwave, fridge. Hear the ocean roar in this very comfortable 850 square foot cabin in front of the wood fireplace. This home is safety inspected and licensed through Tillamook County. Partial ocean view from Knotty Pine living room with vaulted ceiling. Living room stereo with CD player and IPod hookup. Free high speed wireless internet service. Free long distance phone service. 32' flat screen HDTV with satellite dish and DVD player. Second HDTV and DVD player in master bedroom. Over 200 DVDs to view. Large deck with a partial ocean view and beach view and a view of Cape Lookout and a peak view of the Arch Capes. Very kid friendly with games, legos, other toys and beach toys. Great for a family and sleeps up to 6 people. Master bedroom has great partial ocean view. Small knotty pine walk-through bedroom with a double bed. Double size bunkbed in knotty pine room off of master bedroom. Unique tree-deck in a Sitka spruce tree with a unobstructed ocean view (use is at renter's risk). If you want to go boogie boarding in the ocean, we have a large selection of full wetsuits for children, men and women ( ranging from child size 4 to adult XXXL), booties, gloves and boogie boards for your use. Your well behaved pets are welcome with a small fee. Kitchen is equipped with coffee maker, French press, coffee grinder, toaster, waffle iron, rice cooker and crab pot. Parking available for 2 vehicles along the street of the cabin. There are several full time residential households directly adjacent, so we ask renters to please be considerate with the level of noise. This home has been licensed and inspected as a rental property by Tillamook County. We have loved the Oceanside community and its beauty for over 20 years. Fortunately, we are able to buy this wonderful cabin as our second home. We hope others enjoy it as much as we do. Oceanside is a picturesque town overlooking the Three Capes rocks which are a wildlife refuge for a multitude of birds and sea lions. The area is at the 'end of the road' with little commercialism and natural beauty. It is also one of the closest coastal towns from Portland which is 90 minutes away. The cabin is a real 1930s cabin which has been modernized, but maintains its comfortable charm. Even though it is small ( about 800 square ft.), it has a great floor plan so it feels larger to me. The view from the house and deck is great, and the tree deck is alot of fun with an awesome view. I've slept up in the tree deck and with the surf sounds, I felt I was sleeping in the ocean. Vaulted ceiling Knotty pine living room with wonderful ocean view! Stereo with CD player and plug for Ipod if one has Pandora, etc. We have a very large and varied selection of over 200 DVDs on hand in the cabin for those rainy days. Sunny yard by tree deck with wonderful ocean view. Main large deck with fantastic ocean view. Picnic table for up to 8 people along with bench that doubles as a 1/2 picnic table and 2 large adirondack chairs. Wetsuits, gloves and booties of many sizes as well as boogie boards and a skim board. Option to use unique tree deck with unobstructed ocean view ( use at renter's risk, as tree decks are not inspected for safety in Tillamook County), Option to use the many sizes of wetsuits, booties and gloves as well as boogie boards and a skim board so you can have fun being in the Pacific ocean without freezing! We loved this little cabin! This is an awesome cabin! The four of us and our dog had a great couple of nights in Oceanside in this vintage cabin. It's certainly a funky, classic cabin, and we love that, but it's been meticulously maintained and upgraded with technology (that really impressed our teenagers), as well as very comfy beds and furniture. The tree deck is fantastic, both in concept and construction, and the view is about as good as it gets in this fun little town. We will definitely come back in the summer to enjoy this place in warmer weather. Nice job Rory! What lovely accommodations we found at The Knotty Pine! We found it helpful to have some basic staples in the fridge and in the cabinets, and knew there were backups of other items in the garage should we have needed it (we did not). The views of the beach and sunsets were just awesome! Even on rainy days, it was relaxing and quiet and peaceful. The baseboard heaters were helpful since we're not used to 50-degree weather in Hawai'i! The sunny day was perfect for an outing to Cape Mears, as well as an adventure to Tillamook to do the self-guided tour of their premises. Oceanside is a perfect place to unwind, and The Knotty Pine will be a fond memory for us. So many good things to say about this cute little beach house. It had everything we needed to be comfortable. The tree deck was amazing especially to watch the parasailers who floated by all day long. The beds are very comfortable and the walk to the beach is easy. Everything was perfect, the cabin and the weather for 3 nights. Very friendly, well equipped cabin. Loved the outdoor furniture. Be careful of the ocean! Sunday morning just before we left, we took another walk on the beach. My dog and I got caught up in a sneaker wave and went under the water and got pulled. It was frightening. We were able to climb up onto rocks to get to safety. I broke my knee cap in the process. We are both safe, but please be careful! So sorry to hear of your accident in the ocean! I hope you recover well. Sneaker waves can happen any time of year. Years ago, a group of us were caught by a sneaker wave when we just coming out of the beach tunnel in Oceanside and were lucky no one was hurt, just soaked to the gills. Great little funky cabin,stocked with everything we needed and more. The tree house is the best! Relaxing and cozy with a beautiful view. Oceanside is a quiet town of 300 residents with a restaurant and coffee shop. 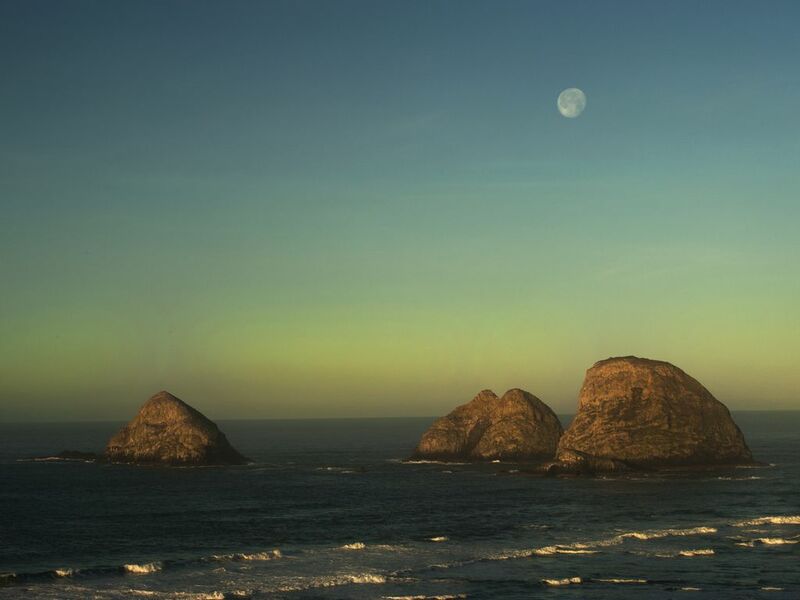 The Arch Cape rocks off of the beach in Oceanside is a National wildlife preservation site for largest colony of breeding tufted puffins and the largest common murre colony south of Alaska as well as the only northern Oregon pupping site for the threatened Steller Sea Lion. The areas' activities include kayaking, boating, hiking, hang gliding, surf, clamming, crabbing, fishing, tide pools, caves, bay, whale watching, seal watching, big sandy beach. Local points of interest: Tillamook Cheese Factory, golf, Three Capes Scenic Loop, Lighthouse, Tillamook Naval Air Museum, Tillamook Historical Museum and much more. We also have available a large selection of full wetsuits ( from child size 4 to XXXL adult size), booties, gloves and boogie boards for use at renter's own risk. Rates are subject to change until confirmed. Renter is responsible for all damages and missing items during their stay. Pet fee is $25 per pet per stay up to 3 pets. Website does not all for this in the fee section. We reserve the right to charge extra as a result of this. Holiday weekend ( MLK and President's day weekend) rates during the low season are $150/ night.